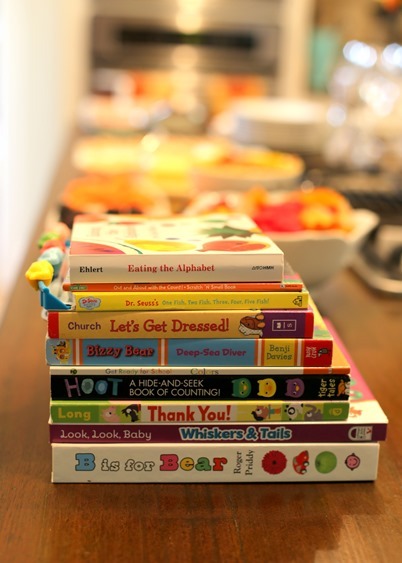 Today’s blog post recaps a Toddler Book Exchange party I hosted in our house last week. My friends and I had so much fun swapping books for our little ones and snacking on delicious foods from ALDI. Thank you so much to ALDI for sponsoring this post! You may find the ALDI nearest you by clicking here. Last Wednesday night, I had a handful of my girlfriends over for a toddler book exchange party! My mom actually inspired the party when I was talking with her about how Chase absolutely loves some of his books and then never shows even the slightest bit of interest in others. We read lots of books in our house every day and will often go through phases where certain books are Chase’s favorites for a week or so and then he’ll move onto a new favorite but he’ll still enjoy reading his old favorites for a long time. And then there are the reject books. The books he never got into that just fell flat from day one. When I was explaining this to my mom, she suggested swapping books with girlfriends who have kids of a similar age and the Toddler Book Exchange Party was born! I texted some of my usual play date buddies about the idea and everyone was immediately on board. 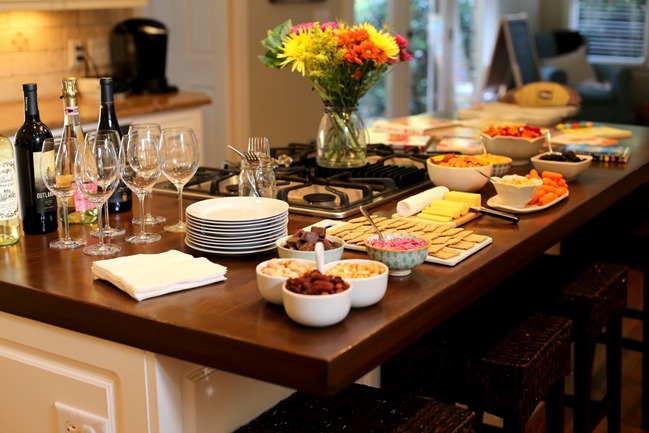 I knew from the beginning I wanted the party to be laid back and casual, so I opted for a simple spread of appetizers, snacks and wine and invited everyone over for a couple of hours of chatting and book swapping! The rules for the party were simple: Bring a book, take a book! I had loose guidelines to bring around three books but more or less was fine and you could leave the party with as many books as you brought to the party. The book exchange ended up being SO fun and also oddly interesting! I was shocked when some friends brought books Chase LOVES (like Go Dog, Go) because they fell flat with their little ones and it just proved once again that every child is different and what works for one kid doesn’t always work for others. As for the party food, ALDI saved the day! I got everything for our book exchange party at ALDI, from the wine, stuffed olives, grass fed cow’s milk cheeses (did you know ALDI sells Kerrygold!?) and Specially Selected Hand Rolled Goat Cheese Logs (so creamy!) to the crackers, hummus, caramels and flowers! 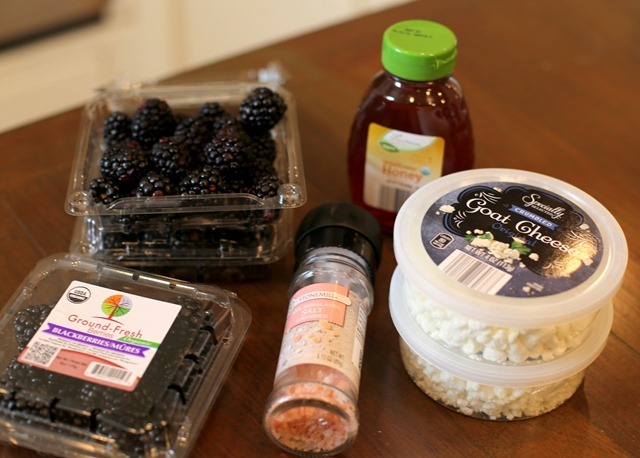 I used a handful of the ingredients to put some homemade touches on a few of the dishes, including a goat cheese blackberry dip (made with one container of Specially Selected Crumbled Goat Cheese + 1 teaspoon SimplyNature Organic Wildflower Honey + 1 half-pint organic blackberries) and maple rosemary roasted nuts. More than one of my girlfriends requested the recipe for the nuts, so I wanted to be sure to share them here as well since they were so tasty and EASY to make! 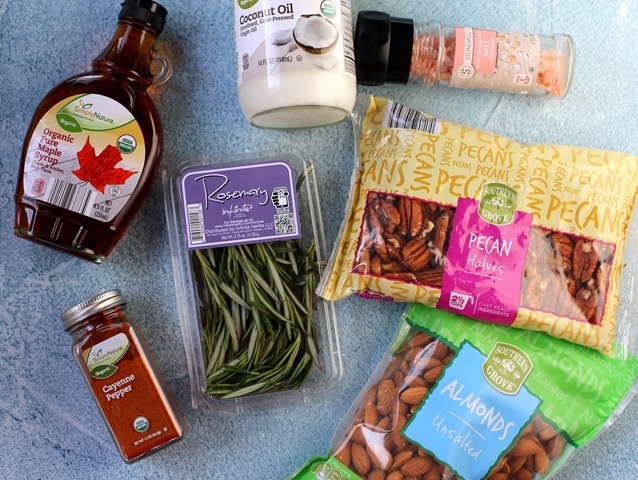 Combine all ingredients in a large bowl and toss to thoroughly coat nuts in the oil, syrup and rosemary. Pour onto a large baking sheet sprayed with cooking spray. Sprinkle with additional salt if desired. Roast for approximately 25 minutes, flipping the nuts regularly to ensure even roasting. I served the nuts along with Southern Grove Roasted Pistachios and Southern Grove Roasted Cashews (can you tell I’m obsessed with ALDI’s bulk nuts!?) 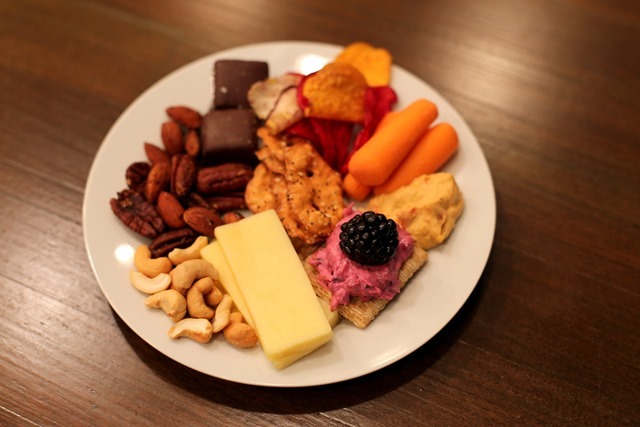 and had someone comment on my Instagram Story about the party telling me the nuts would’ve looked really awesome on a big slab of butcher’s block with an assortment of cheese, berries and dips. 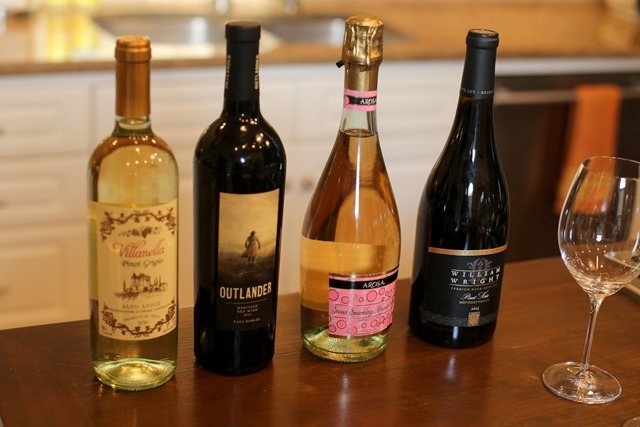 I also selected an assortment of red, white and bubbly wine from ALDI to serve and every bottle I chose was under $10. Ryan and I have really enjoyed ALDI wines in the past (their Outlander Cabernet Sauvignon is my personal favorite – it was a 2017 Chefs in America Masters of Taste Gold Medal winner – and I love their Villanella Pino Grigo) and I couldn’t resist picking up a bottle of the Arosa Sweet Sparkling Moscato Rosé because it seemed like a fun, festive option that I knew my fellow sweet-loving wine friends would enjoy. I added a bottle of the William Wright Reserve Pinot Noir to my bottle because it received 90 points and a Gold Medal at the 2017 BTI World Wine Championship and the 2017 Chefs in America Masters of Taste Gold Medal. And if you think the two Specially Selected Sea Salt Caramels on my plate are the only two caramels I ate all evening long, you’re definitely mistaken. They’re way too good and way too addicting! I truly had the best time at our Toddler Book Exchange Party! 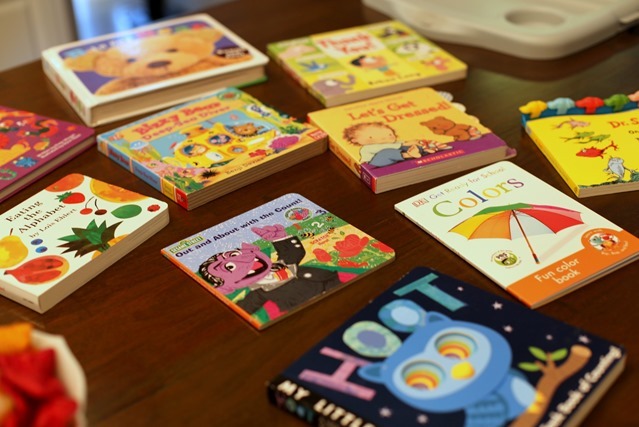 Everyone left with full bellies and some new-to-them books to try out with their little ones. Success! Have you ever been to a swap/exchange party? I would LOVE to host a clothing/accessories swap/exchange party with friends and think it would be a blast and a great way to refresh your wardrobe without spending any money! I hope the Aldi near me sells wine! New Jersey liquor laws are super weird. I had absolutely no idea that Aldi had such amazing wines for so little. You’ve totally inspired me to consider throwing an accessory exchange party with friends or even book swap party! I’d loveee to do an accessory/clothing swap but it intimidates me a bit more than a simple book swap! I’ve done a cookie swap party before and it was a total blast! Think your idea for a clothing/accessory swap is fantastic! Go for it! You also always have to most delicious looking snack spread! Those sea salt caramels are LIFE!! My favorite. They are so good!! I am mad they’re gone now! Haha! I don’t have kids so a clothing or accessory party would be right up my alley! Or even a cooking tools type swap where each person brings a kitchen or serving item they no longer use. That could just be the cook/blogger in me though, but that would be AMAZING! I’m thinking a waffle iron, serving tray, wine glasses or cheese knife set someone doesn’t really use. A cooking tools swap is such a good idea!! Also, thanks for the butcher block link! We just bought a beautiful Butcher Block cutting board from Marshalls. Of course it just came into our Canadian city, so I’m a little obsessed over that store. I like the book exchange, no toddler here, but I could do that with a few friends and books we have read or maybe games that were a bust at our house but might be good for a different family. Maybe even do a few test runs of some of them. I am sure no matter what, it is a good night to have friends over. I love your blog even though we are in different age ranges, it still has so many things that appeal to me. Isn’t Marshalls the best!? I love that store. Do you have HomeGoods in your area, too? I should definitely check there for a butcher’s block cutting board! Now your blog has made me wish there was an Aldi! Thank you for the reply, it’s always so nice to have a blogger chat back, just from your stories on here, you have a busy life. My girlfriend hosted a clothing swap. She set up clothing racks for each girl that was coming and we simply hung up our clothes and then shopped around while we drank wine! It was so much fun! I love Aldi’s sea salt caramels! 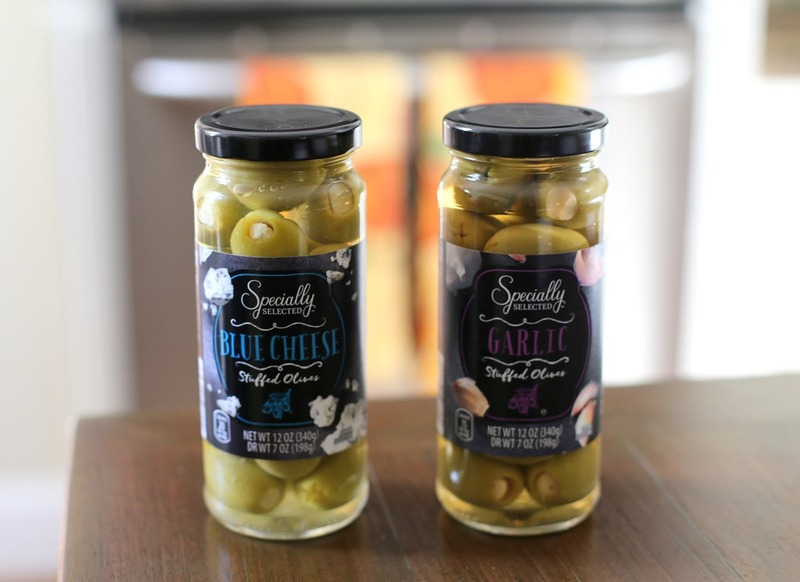 They’re absolutely delicious and super addicting! What a great idea for books that were not a hit! I got a nice butcher’s block cutting board from IKEA (http://www.ikea.com/us/en/catalog/products/00233429/) its been fantastic and it’s really inexpensive. I really do love reading these posts that incorporate real life and end with a tasty recipe. 🙂 This is such a good idea. I don’t have any kiddos yet, but I will keep it in mind for the future! 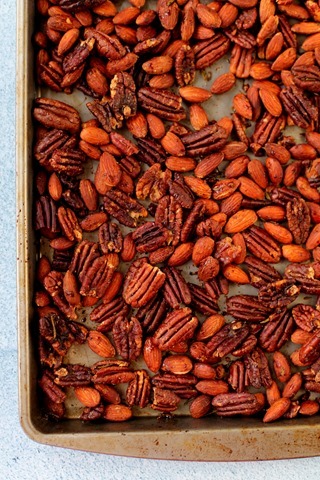 I was literally just thinking I wanted to make some spiced nuts to go with our Thanksgiving cheeseplate! I love the idea of a toddler book exchange, so cute! Amazon for the butchers block – my husband is big into smoking meats and this is where he got his butchers block. Ugh I wish the Aldis in PA would sell wine!! My girlfriend hosted a wine swap where everyone brought a bottle between $10-15. We chose numbers, went in numerical order and picked a bottle to take home. It was fun! Can’t wait to try that roasted nuts recipe. Ooooh, a wine swap seems fun! My friends and I do a clothing/accessories swap which we call a “Give and Get”. We usually do it about twice a year. We sort all the clothes by items (pants, tops, dresses) and size. Everyone goes through and tries things on and takes whatever works! Everything leftover is donated at the end. It’s great to clean out your closet and get a few new things without spending any money. Book exchange is such a good idea! This seems so much fun, and now I want to have a kid just so I can do this. Haha. An ALDI just opened not far from me. I need to check it out, especially for $10 bottles of wine! we are all about the library in our house, too!! i think we’re there every other week these days! I am doing a christmas cookie exchange in a couple of weeks! I think I may steal this appetizer recipe! After all, I am already going to be using your Sugar Cookie recipe! 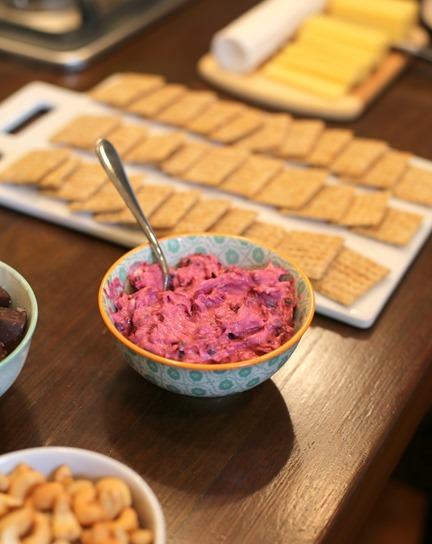 The blackberry dip looks great! Do you blend all the ingredients together? I love swaps/exchanges! My good friend hosts a swap twice a year. She invites a bunch of lovely ladies and we bring clothes, nail polish, books, jewelry etc and go to town. I swear half my wardrobe is a swap item! The rest we drop off at the goodwill. It’s great to get the opinions of a bunch of awesome women when I’m trying on clothes and there’s no risk since they’re free. My favorite part is seeing someone love something that wasn’t working for me! Love this idea for a party with kids and LOVE all the Aldi appetizers. 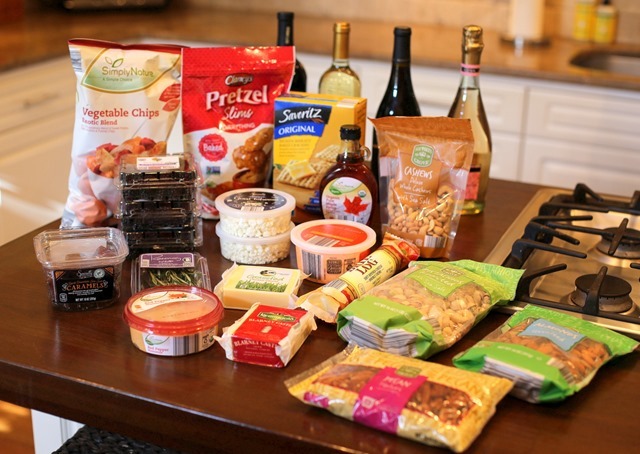 We are total Aldi people in my house, and I’m looking forward to creating a Christmas party spread next month with some of their goodies! What a great idea! We definitely have some kids books that they have just never been interested in. Hope you have a great day! This sounds like a great idea! I was also thinking a toy exchange would be great to do with similar aged children. Hope you guys had a beautiful Thanksgiving! So glad you loved the idea – I was so nervous making a suggestion in case it was taken the wrong way. Have a great week! Made the nuts. Burnt the nuts. Good thing Aldi bulk nuts are cheap, gonna have to buy more and retry tomorrow! 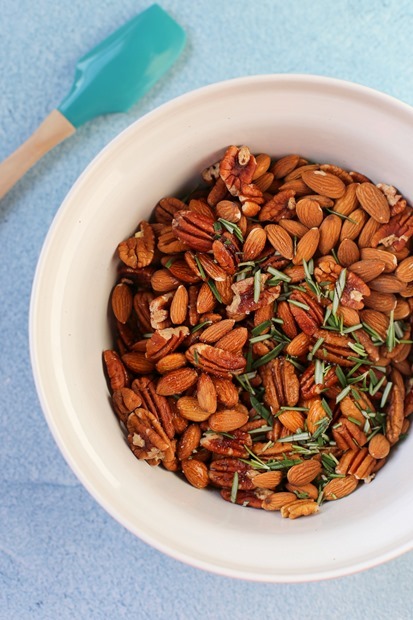 I just wanted to let you know that I made your maple rosemary roasted nuts for Christmas and they were a huge hit! I actually quadrupled the recipe to give out in jars as small gifts to my husband’s side of the family at their annual Christmas celebration, but ended up having a lot leftover. That ended up being a great thing because I took the rest to my parents’ for Christmas Eve and Christmas and everyone loved them! They got eaten up pretty quickly and yesterday I just made another batch (just one recipe this time!) so that I could give some to my sister’s boyfriend as a gift, and I know that the rest will be gone soon. My mom just requested that I bring them to our New Year’s dinner tomorrow! So thank you for this delicious and crowd-pleasing recipe! Happy New Year!